VOTEC delivers data-driven election management solutions and best-in-class service to election officials nationwide in the key areas of Voter Management, Data Management and Asset Management in support of the successful, secure and accessible conduct of US elections. The WelcomeVoter Kiosk uses a reliable and affordable notebook computer as a secure and poll worker friendly tool for validating voter eligibility at the polls. Our Kiosk is engineered to efficiently manage all polling place processes while meeting mandated accessibility and usability standards. 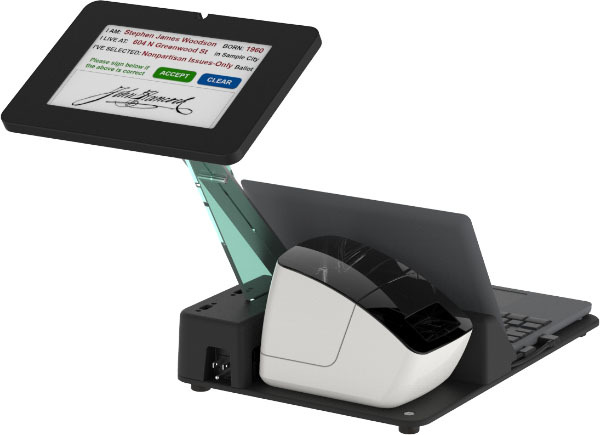 The WelcomeVoter Kiosk is a uniquely configured electronic poll book solution. The WelcomeVoter Kiosk features a voter-facing screen giving the voter the reliable consumer point-of-purchase experience. This approach engages the voter as he/she co-navigates the authentication and validation process in sync with the poll worker. The WelcomeVoter Kiosk saves time and imparts confidence throughout the check-in process as the tablet screen presents instructions and feedback to the voter.